In all societies a portion of the alcohol consumed is produced, distributed and sold outside formal channels, beyond the reach of government regulations and taxation. The exact size of this unrecorded consumption is for obvious reasons hard to establish. Nevertheless, estimates have been made and these indicate large differences between countries and cultures. A study for the World Health Organization in 2002 estimated that maybe ten per cent of the alcohol consumed in Western Europe is unrecorded, the corresponding figures are 45 per cent for Sub-Saharan Africa and as high as two thirds for parts of South-East Asia. In regions where the unrecorded alcohol consumption is high, this fact necessarily has to be taken into account when planning strategies and interventions to reduce alcohol-related harm. Interventions directed to the formal, legal production and sale have to be combined with actions to control the unrecorded market. It is in the interests of government from both a fiscal and a policy perspective to move towards eliminating illicit production and sale and to bringing informal supply under the taxation system. Diyanath Samarasinghe, professor at the University of Colombo, Sri Lanka, gives an introduction to how the problem can be understood, and how it can be addressed; by communities, governments and NGOs. FORUT, a development agency with poverty reduction as a priority, takes special interest in this issue. 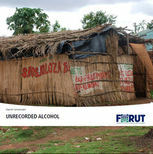 The poorest people of the poorest countries tend to consume illicit liquor as their main source of alcohol. Such beverages are often cheaper than legal alcohol, also because they are not taxed. For FORUT it is imperative to have a knowledge-based, case-specific and comprehensive approach to alcohol prevention, and addressing the unrecorded consumption is a key part of such an approach.